Spring Training started this morning for Mariners pitchers and catchers, but not everyone that is supposed to be here was here. Right-handed pitchers Jesus Colome and Yusmeiro Petit were no-shows. Neither has received working visas from the Dominican Republic and Venezuela, respectively. Colome, who has pitched in the Major Leagues for the past nine seasons, signed a Minor League contract on Feb. 10 and was invited to camp. Petit was acquired on a waiver claim from the Diamondbacks on Nov. 4. The first day included the dreaded 300-yard shuttle “to see how good of shape the guys are in. That’s always interesting to see. “We’ll do same thing we did last year, bring guys in at the end of the day and have some our meetings. 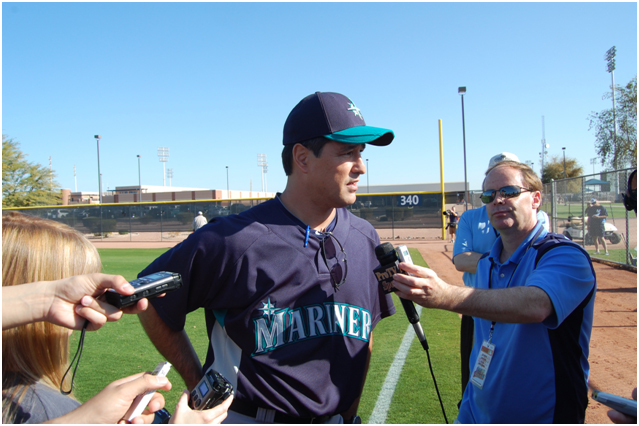 We should have all of our meetings done with the pitchers in four days,” Wakamatsu said.